Acres of flat open land and the proximity to the wealth and educated workforce of New York City made Long Island an ideal place for the aviation industry to settle during the first years of the 20th century, when flying was in its infancy. It didn’t hurt that Europe was relatively close, too. Though the Wright brothers chose Kitty Hawk, N.C., for their pioneering short hop in 1903, Charles Lindbergh left from Roosevelt Field in 1927 for what became the first nonstop flight across the Atlantic. (The field, now better known for its shopping mall, was an airport in the early 1900s and was named in honor of Quentin Roosevelt, Theodore’s son, who was killed in air combat during World War I.) Lucky Lindy, as he was sometimes called, landed in Paris 33½ hours after taking off on his solo quest, for which he won $25,000 and a place in history. “Lindbergh’s flight revolutionized aviation, because it showed the future potential of the airplane,” said Joshua Stoff, curator of the aptly named Cradle of Aviation Museum in Garden City (the site of another former airfield) and the author of books and articles about the history of flying. That potential was realized here, when aviation became the Island’s largest industry from the 1940s into the 1960s and aircraft made on Long Island played crucial roles during both World Wars, especially the second, as well as in the lunar program. “Aviation still has an impact, though it’s a lot less now,” said Stoff. No planes are built here anymore, but some 240 companies manufacture parts. Most of the 300,000 aviation-related employees who live on the Island however, work for airlines or in services like catering at Kennedy and LaGuardia airports. The early influx of engineers and skilled workers led to a population ready to work in high tech. A historic balloon flight in 1873 and a notable glider ride launched from bluffs along the North Shore in 1896 are among early milestones. The Hempstead Plains—that enticingly flat landscape in Nassau County—soon became a busy hub for the newfangled flying machines, with three airfields (Curtiss, Mitchel and Roosevelt, though each had other names at times) and a host of significant events. An international competition among flyers took place in 1910. 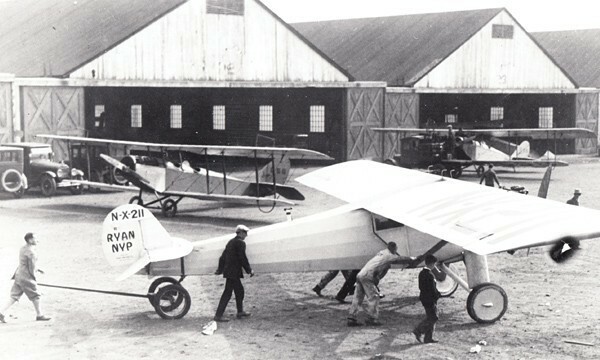 The following year saw the nation’s first transcontinental flight, from Long Island to California, and the first official air mail flights in the United States. Several small airplane companies came and went in the early 1900s, each experimenting with different original designs. “They were important stepping stones,” Stoff said. But they didn’t get the military contracts that the large Long Island manufacturers did, and didn’t survive the Depression, when civilian planes weren’t selling. Three large companies came to dominate the local manufacturing field, each reaching about 25,000 employees during their heydays before they succumbed to mergers or acquisition. The Sperry Corporation was founded as Sperry Gyroscope in 1910 by Elmer Ambrose Sperry, an inventor, to manufacture navigation equipment before adding aircraft components during World War I. In 1986, it merged with the Burroughs Corporation to become Unisys, though some divisions later went to other companies. Republic Aviation Corporation, based in Farmingdale and originally called Seversky Aircraft Company, was founded in 1931 by Alexander de Seversky, a Russian-born World War I pilot who, like Sperry, was an inventor. The company’s most important design for World War II was the P-47 Thunderbolt, followed in later years by the F-84 Thunderjet and F-105 Thunderchief. In 1965, it was acquired by Fairchild, another aircraft firm with Farmingdale roots that has since been gobbled up by other companies. The Republic name remains with the airport in East Farmingdale, where the American Airpower Museum keeps a squadron of operational World War II aircraft and offers plane rides and special events like a Memorial Day Weekend Salute to Military Aviation. Grumman Aircraft Engineering Corporation, which later became Grumman Aerospace Corporation, started its legendary history in 1930 under the leadership of Leroy Grumman, a graduate of Huntington High School before he became an engineer and pilot. For many years, Grumman was Long Island’s largest employer overall, not just in aviation. The company was based in Bethpage, where it produced the F6F Hellcat, considered critical to American victory in World War II, and the Apollo Lunar Module, arguably the most famous aircraft ever made here. 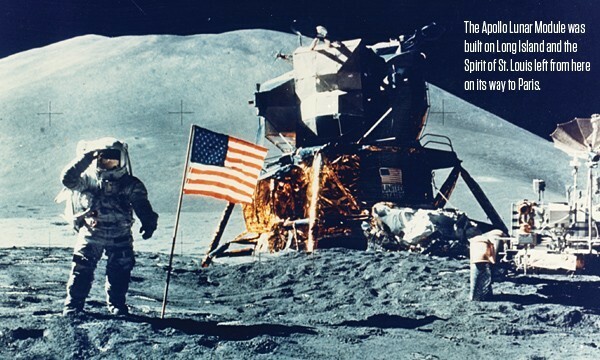 Six modules landed on the moon from 1969 to 1972 and others are displayed in museums including the Cradle of Aviation Museum. 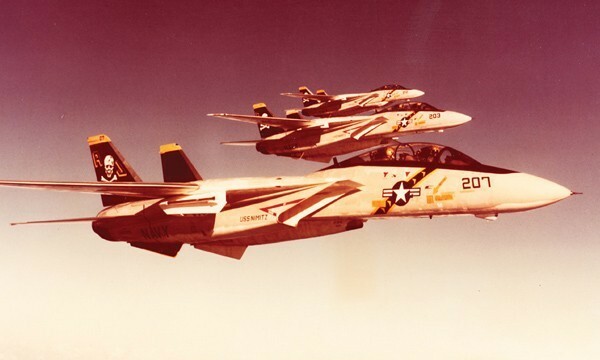 A company outpost in Calverton made the supersonic F-14 Tomcat for the Navy beginning in the Vietnam era. In 1994, the company was acquired by the Northrop Corporation to become part of Northrop Grumman and mostly disappeared from Long Island. Grumman has remained a strong presence however, through its loyal former employees, many of whom stay in touch and belong to retiree clubs and other Grumman-related organizations. “They loved working for the company,” said Pat Van de Wetering, whose husband Joseph worked there for 35 years. “It was a wonderful company. They were wonderful to their employees. 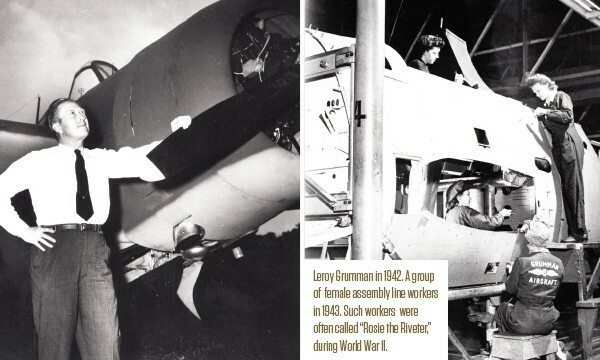 They took care of them, with family picnics and a turkey at Thanksgiving.” Most “Grummanites,” she said, stayed with the company for their entire careers. She and her husband were both involved in creating Grumman Memorial Park, which opened in 2000 on an acre of the former Grumman Aerospace Flight Test Facility in Calverton. An F-14, an A-6 Intruder and other memorabilia are on display and a Walk of Honor has also been constructed. So far, about 3,000 bricks have been installed in the walk, most of which honor former Grumman employees.